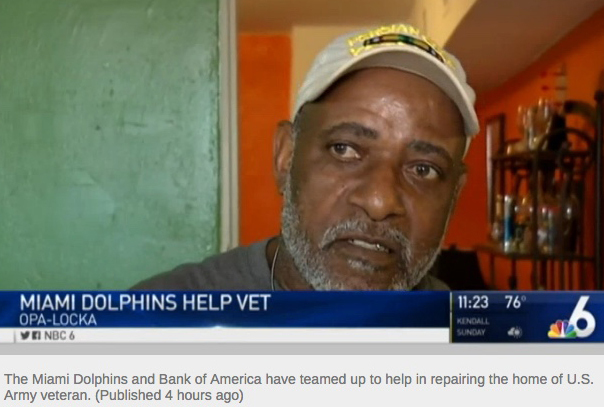 In honor of Veterans Day, the Miami Dolphins partnered with Bank of America in giving the home of a U.S. Army veteran a major makeover. Joe Riddick, 65, is a U.S. Army veteran who's served in Vietnam, and parts of the Gulf War. "I did it for the country you know, because I love this country of America," Riddick said. "I'm glad to do it, and I would do it again." Riddick and his wife Shonda now live in Opa-Locka but his home isn't a symbol of a heros welcome. The home is in need of several repairs. That's why the Miami Dolphins and Bank of America is partnering to give Reddick's home a makeover.